Losing weight has become easier with the various weight loss surgeries that achieve quicker and significantly higher weight loss than the other methods of achieving weight reduction. Through these weight loss surgeries, people who are obese can now obtain a reversal in certain disease conditions that are associated with obesity such as hypertension, diabetes, dyslipidemia, sleep apnea, etc. This has led to a better quality of life and an overall increase in lifespan in this category of people. The weight loss surgeries use two primary mechanisms to induce weight loss. The first is by reducing the amount of food intake while the other mechanism is by reducing nutrients absorption. Some even combine the two mechanisms. Gastric sleeve surgery utilizes the first mechanism (i.e., reducing the amount of food intake). This is made possible through the reduction of the stomach capacity by resecting (cutting away) about 80-90% of the stomach leaving a sleeve (banana) shaped 10-20% to perform the function of the stomach. This leads to the sensation of fullness earlier during the meal and subsequently reduces the amount of food intake. The other minor way through which this surgery induces weight loss is by reducing one’s appetite. The stomach produces ghrelin, a hormone that increases the appetite. Reducing the size of the stomach significantly reduces the quantity of this hormone. Gastric Sleeve in Mexico from $3,899. Learn more by Pre-Qualifying now. However, for every surgical procedure, there are advantages and disadvantages associated with it. 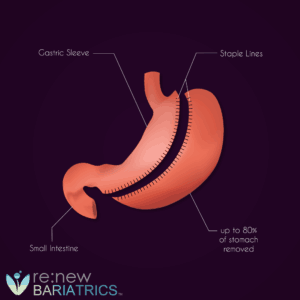 Below are the pros and cons of the gastric sleeve surgery. Gastric sleeve surgery is currently done by laparoscopically, reducing blood loss during operation; there are a less postoperative pain and early postoperative rehabilitation. Most patients get discharged by 72 hours post-op. The complication of deep vein thrombosis associated with prolonged immobilization is therefore avoided. Gastric sleeve surgery is one of the bariatric surgeries that achieve the highest weight reduction within the shortest possible time. The average expected weight loss at 12 months after surgery is about 56.1-59% of the excess weight. Nutritional deficiency is not a typical complication of gastric sleeve surgery as the procedure is purely restrictive with no malabsorptive component. When dietary deficiencies occur in this group of people, it is often due to inadequate intake of such nutrients probably from non-compliance with the post-op dietary plan. Therefore individuals who undergo gastric sleeve surgery spend a lesser amount of nutritional supplements as compared with other bariatric surgeries. As the intestine is left undisturbed, the chance of developing dumping syndrome after the gastric sleeve is negligible. Thus, your risk of developing diarrhea, abdominal cramps, sweating, tremor, and headache after eating, due to the rapid and untimely dumping of the stomach contents into the intestine, is less in the gastric sleeve when compared with other bariatric procedures. If weight loss becomes inadequate, gastric sleeve surgery can easily be converted to other forms of bariatric surgeries. In fact, if the conversion is to duodenal switch, it reduces the operative time as the gastric sleeve is one of the components of duodenal. The remaining stomach can stretch and become more prominent if you do not follow the proper eating habit. This may lead to inadequate weight loss or regain the already lost weight, necessitate a pouch reset or revision surgery. The most feared complication of gastric sleeve is leakage of stomach content through the staple line into the abdominal cavity. Although the chance of this complication occurring is 2.4- 5%3, 4, it can be life-threatening if not promptly diagnosed and managed. The most gastric leak will occur within 3days post-op while few may be delayed until one month after surgery. Another surgery is often required to correct this complication. For obese individuals who experience heartburn, it is advisable to choose other bariatric surgery. Heartburn in overweight people is due to reflux of acidic contents of the stomach into the lower part of the esophagus with subsequent irritation of the lining. This results in a burning sensation in the chest which is often aggravated by lying down. People who had gastric sleeve surgery have been found to develop heartburn after surgery while the symptoms get worse in those that had it before surgery. Only a few people experience relief. As opposed to intragastric balloon devices that are removable and laparoscopic gastric banding that is reversible, gastric sleeve surgery is not reversible once a portion of the stomach has been resected. The procedure can only be converted to another bariatric surgery. Hair loss can occur in up to 41% of people after gastric sleeve surgery. It is however transient and often resolves by 6-9 months after gastric sleeve surgery.it can be prevented by adequate nutritional supplements. In conclusion, gastric sleeve surgery has advantages and disadvantages. The pros, however, outweigh the cons and in the hands of best surgeons and nutritionists, the drawbacks can further be minimized. In comparing other bariatric procedures, gastric sleeve pros outweigh the cons considerably. Gastric sleeve surgery is a great weight-loss tool for the long term. Interested in undergoing Gastric Sleeve Surgery in Tijuana Mexico? Please contact our helpful, knowledgeable patient educators who can help guide you through the entire process of getting approved. Moon Han S, Kim W, Oh J. Results of Laparoscopic Sleeve Gastrectomy (LSG) at 1 Year in Morbidly Obese Korean Patients. Obesity Surgery. 2005;15(10):1469-1475. doi:10.1381/096089205774859227. Aurora A, Khaitan L, Saber A. Sleeve gastrectomy and the risk of the leak: a systematic analysis of 4,888 patients. Surgical Endoscopy. 2012;26(6):1509-1515. doi:10.1007/s00464-011-2085-3.